(a) The vehicle must be unloaded before jacking up or raising the vehicle. Never jack up or raise a heavily loaded vehicle. (b) When removing any heavy components like the engine or transaxle, the vehicle center of gravity will shift. To stabilize the vehicle, place a balance weight in a location that will prevent the vehicle from rolling or shifting, or place a transmission jack under the appropriate jack position at the opposite end of the vehicle. (a) Follow the safety procedures outlined in the lift's instruction manual. (b) Do not damage the tires or wheels while driving onto the lift. (c) Use wheel chocks to secure the vehicle. (a) Work on a level surface. Use wheel chocks at all times. (b) Use safety stands with rubber attachments as shown in the illustration. 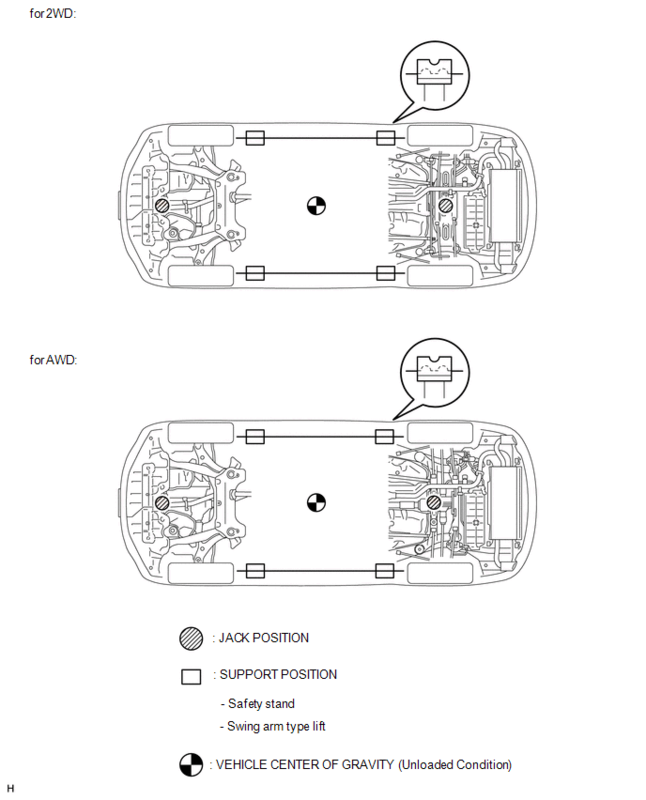 (c) Set the jack and safety stands exactly under the specified locations on the vehicle. (d) Do not work on or leave the vehicle supported only by a jack. Be sure to support the vehicle with safety stands. (e) When jacking up the vehicle, first release the parking brake and move the shift lever to N.
(1) When jacking up the front wheels first, make sure wheel chocks are behind the rear wheels. (2) When jacking up the rear wheels first, make sure wheel chocks are in front of the front wheels. (1) Before jacking up the front wheels, place wheel chocks on both sides of the rear wheels. (2) Before jacking up the rear wheels, place wheel chocks on both sides of the front wheels. (h) When lowering a vehicle that only has its front or rear wheels jacked up. (1) Before lowering the front wheels, make sure wheel chocks are in front of the rear wheels. (2) Before lowering the rear wheels, make sure wheel chocks are behind the front wheels. (b) Use swing arms equipped with rubber attachments as shown in the illustration. (c) Position the vehicle so that its center of gravity is centered on the lift (length of "L" in the illustration should be as short as possible). (d) Ensure that the rubber cushions or swing arms do not contact the body cladding or lower moldings. (e) Be sure to lock the swing arms before raising the vehicle (if equipped with arm locks). 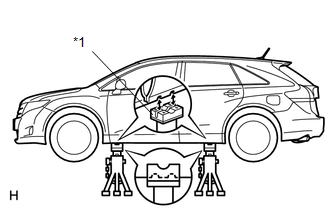 (f) Use the lift to raise the vehicle until the tires are off the ground, then stop the lift and shake the front and rear of the vehicle to make sure that it is stable. (b) Use plate lift attachments (rubber lifting blocks) on top of the plates. 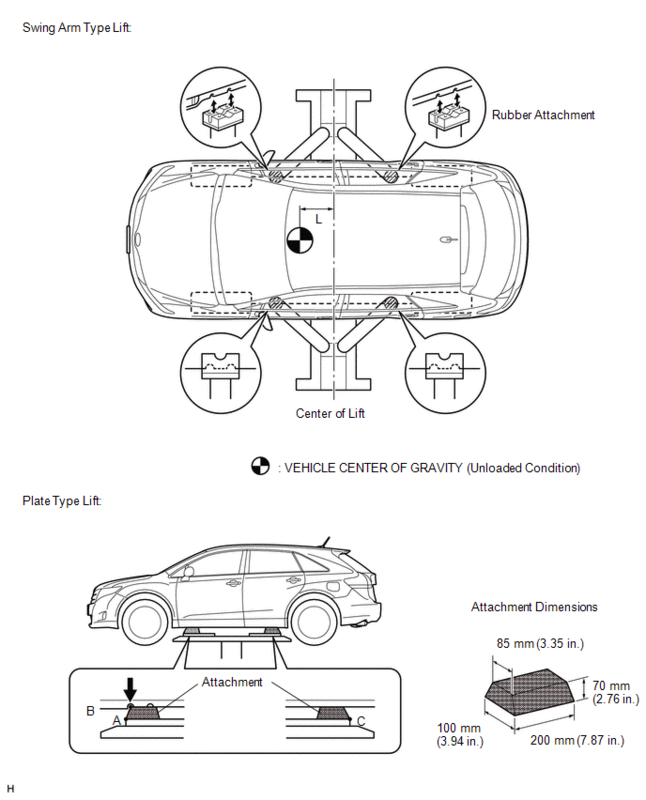 (c) Be sure to set the vehicle to the specified position described in the following chart and shown in the following illustration. Center the vehicle on the lift. Align the plate cushion ends with the lower ends of the attachments (A and C). Align the upper end of the attachments (B) with the rocker flange front side notch. (d) Ensure that the plate lift or rubber lifting blocks do not contact the body cladding or lower moldings. (e) Use the lift to raise the vehicle until the tires are off the ground, then stop the lift and shake the front and rear of the vehicle to make sure that it is stable.